It doesn't need to be a special occasion to send your loved one a very special treat. Out-of-sight, out-of-mind, is not a phrase that you use. You pay attention to your gut instinct and if someone is on your mind a lot, you reach out to them to see how they are doing. Maybe, you want to follow up by sending a gift - a sentimental surprise is a sure way to convey your thoughts and feelings. Did you sense that they are maybe they are feeling down? 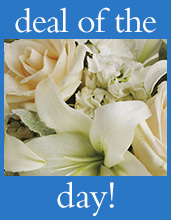 Then send a colorful bouquet of flowers to brighten their day, and let them know just how much you care. Our gorgeous keepsake vases and containers are a gift that's meant to be enjoyed after the flowers are gone, your loved one will have a long-lasting reminder of your kindness. Your bouquet will arrive, professionally arranged, and ready to display. Every Teleflora bouquet is hand delivered by a local neighborhood florist in your loved one's hometown. So even if you can't be there in person, they'll certainly be thinking of you. !